Great for enjoying sake during the winter season, this beautiful cherry blossom sake set reminds you of a snowy storm rushing across small blooming cherry blossoms as spring is just about to arrive. Made in China from quality ceramic, this cherry blossom sake set is a glossy off white color with several small spots of a more defined white spread all throughout the sake jug and sake cup. Small dark blue branches and cherry blossom are blossoming underneath this winter snow like design on the front of both the sake jug and sake cup as well. The sake jug is small with a smooth and glossy exterior and a traditional narrow spout with a small lip to help pour sake. The sake cup is small and round, perfect for either small paced sips of sake or one big gulp. Sold in a set of 1 jug and two matching sake cups, this cherry blossom sake set is a great gift for couples during the holidays. 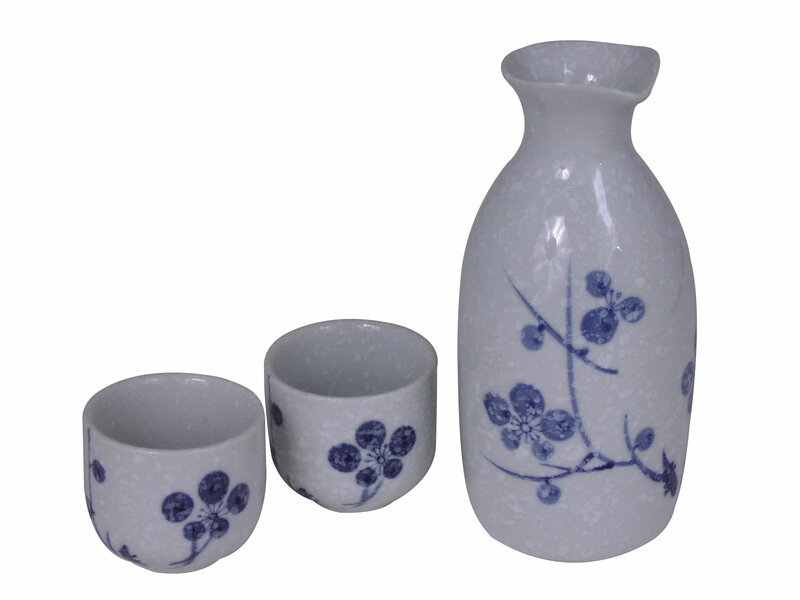 Packaged in a paper gift box, this beautiful sake set can also make a great wedding gift as well.